If you’ve already printed the main pattern pages for the May wallhanging – Bloomin’ Butterflies – it was missing the daisy pattern. I’ve added it now as a separate page link on the main Year of Wallhanging page and here it is again. So remember you need both files in order to complete the design. Beverly just let me know the daisy design is missing. Thanks! I forgot about it since it has to be printed separate from the center since it overhangs the borders. I’ll add a second link to the Year of Wallhangings page for just that portion of the design so be sure you print two files in order to get the whole design. My plans for getting up and doing some cleaning….well they fell by the wayside. Got a phone call to go out to breakfast instead so you know which one I chose! Stopped to do a little shopping, including the quilt shop and the bookstore. 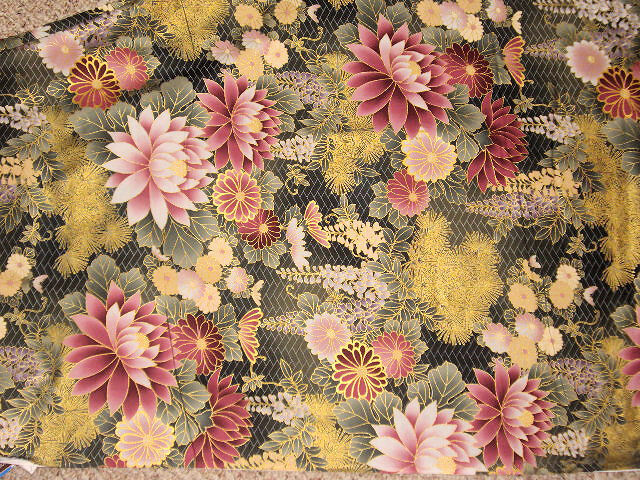 I found another fabric which I may use somehow in the border blocks of the asian themed quilt. I bought the last the of bolt but don’t think there’s enough to do just plain borders (need to do some figuring since it’s a one way design) – so I may have to rework the pieced border I drew since the pieces would cut up the fabric more than I want. But I’ll figure something out. I think this is going to turn out to be a really big quilt tho which is fine – just not looking forward to wrestling it as I machine quilt it. I’ve had a print out of this design I previously posted pinned to my design wall for a week or more and the more I look at it the more I love it. So while I was at the quilt shop, a whole bunch of batik fat quarters jumped into my arms that wanted to be included in this quilt. I need to resize the design smaller tho since those flowers are 24″ across and I really only want them 12″ across or so which means I need to do some redrawing. But here’s what jumped unbidden into my hands. 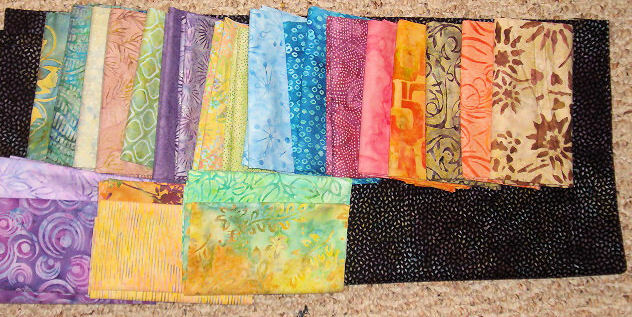 Lots of pretty colors and the black batik they are laying on will be pretty for the black outline – it has a tiny seed print on it in shades of purple and blues. 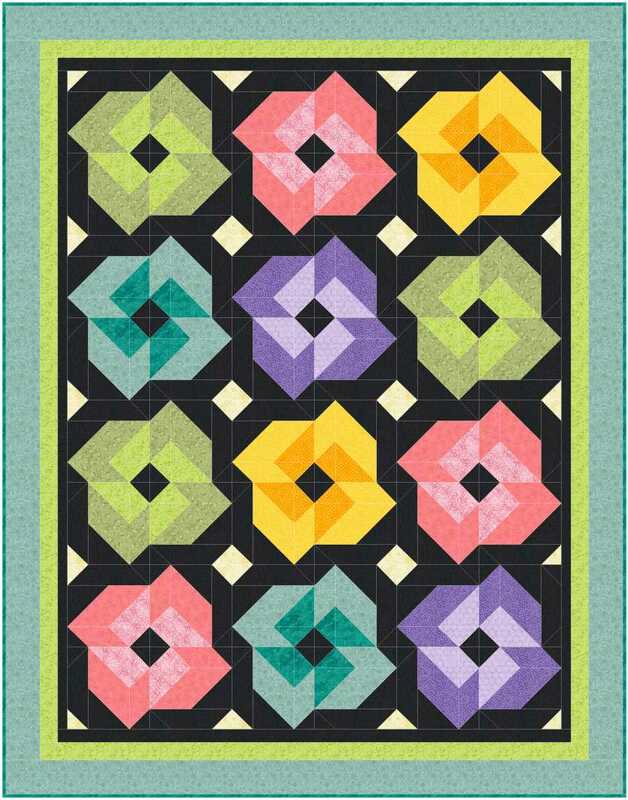 The May year of wallhangings pattern is now available after much wrangling with box.net to get it loaded. Thanks Janet P for giving me a nudge 🙂 I totally spaced on the May pattern. Check back later to see if it’s posted. I’m going to work on getting it ready right now.